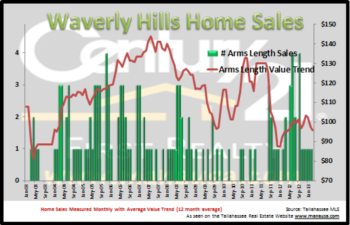 As I was compiling information for yesterday's Tallahassee Real Estate Newsletter, I could not help but [cautiously] smile at the pending home sales report. 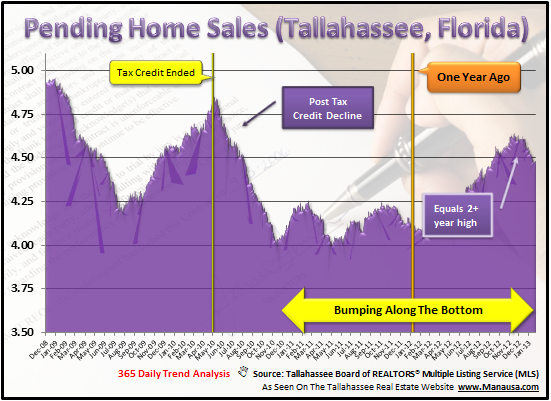 While the Tallahassee real estate market has a long, long way to go to return to normal, it is nice to see the first real long-term positive trend since 2005. Yes, 2005. Of course, growth in pending contracts (the number of homes under contract in the Tallahassee MLS) means nothing if they do not result in an increase in home sales. Fortunately, they have. 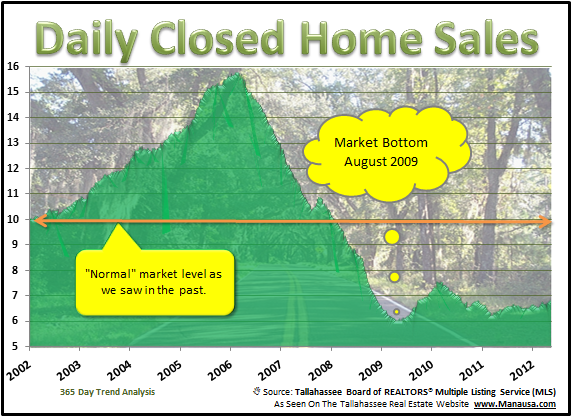 In the real estate graph below, we see that daily closed home sales in Tallahassee have been (very slightly) on the rise since the first quarter of last year. While there was a positive trend back in 2009/2010, I don't consider that a "real" one as it was created with a government stimulus, and it came to a crashing end when the stimulus ended. Our current trend has only shown about an 8% growth in home sales, and though we need much, much more, steady growth is truly a positive sign. The graph below showing pending home sales is the one that brought the smile to my face. The trend of new contracts is rising, and we are even beginning to approach the level attained with the failed government stimulus plan. It appears as if 2012 will produce more home sales than last year, and hopefully we will take this momentum into the future. The gains have been nice, but they are still far too minor to change this market overnight. 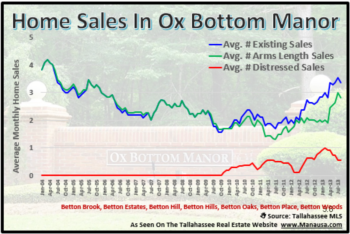 As the Tallahassee housing market continues to see increased buyer activity, we will finally see a diminishing of the inventory problems that have plagued us for more than 7 years. And if you want to know how this change in home sales will affect your ability to sell your home, just drop me a note and we can review your very specific situation.